We hosted a big 4th of July party at our house this year, and a lot of friends came in from out of town. Because our back yard has a respectable hill, I wanted to make a massive slip n slide to bring everyone together. Josh attended Tony Rouleau’s slip n slide party last year and he has a massive setup that he puts a lot of work into. I wanted to make something equally as fun without such a large investment. This seems obvious, but the steeper the hill the faster you’re people will slide. Our hill has a decent slope, but the hilliness creates a contour that would send someone down in a zig-zag path. There is also a bit of a flat area at the bottom of the hill for some water to collect, creating a bit of a splash zone to slow people down. 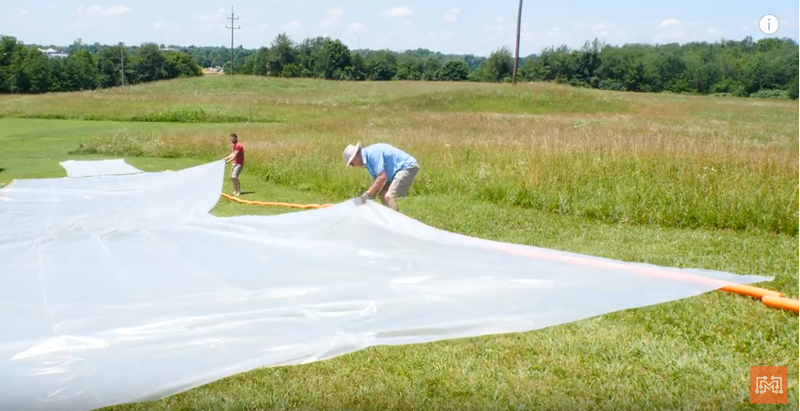 One important note about your area selection, when you place the plastic tarp down on the grass in direct sunlight, it creates a greenhouse-type effect and the grass turned a really dark color. There is a lot of heat being trapped under that plastic sheet and the plant’s moisture is being evaporated pretty quickly. It has been 1 week since we first put the plastic down in that spot and the grass is still brown. We began the search for an appropriate slip n slide by going to our local Dollar Store. There, Josh bought an entire display box’s worth of foam pool noodles, 52 to be exact. The plan for these was to link them together to create a barrier along the sides and the bottom to help channel the water down the hill. For the actual plastic tarp, we went to Lowe’s and found a 20 foot by 100 foot roll of 6 mil plastic sheeting. We began the assembly by stringing together the pool noodles in two identical chains and tying them off at the ends. To keep them in place, I used some U-shaped garden stakes that held the string down to the ground in-between the noodles. At the top of the hill, we unboxed the plastic sheet and rolled it down the hill. After unfolding it to its full length, we laid the sheet over the pool noodles barriers and staked the tarp down as well. We had a gigantic plastic runway in my back yard, all we needed now was some water. 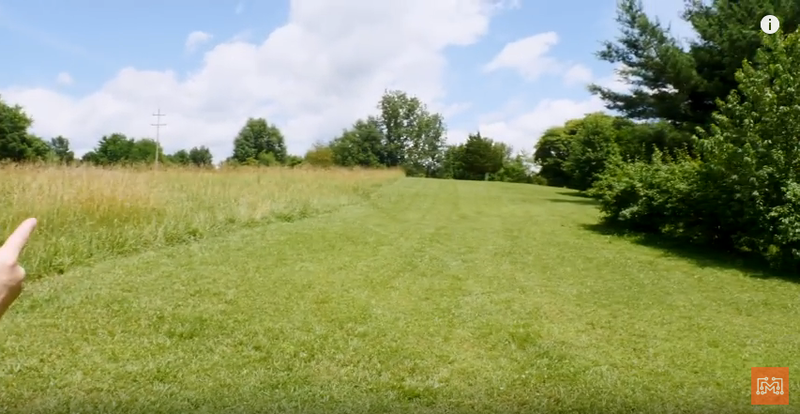 Of course I could have stood at the top with a garden hose and just sprayed water down the hill, but what fun would that have been? At Lowe’s, Josh and I pieced together a PVC arch that would attach to the hose and would spray water through a bunch of drilled holes. The slip n sliders could run through this arch as it sprayed water all over them and the tarp. 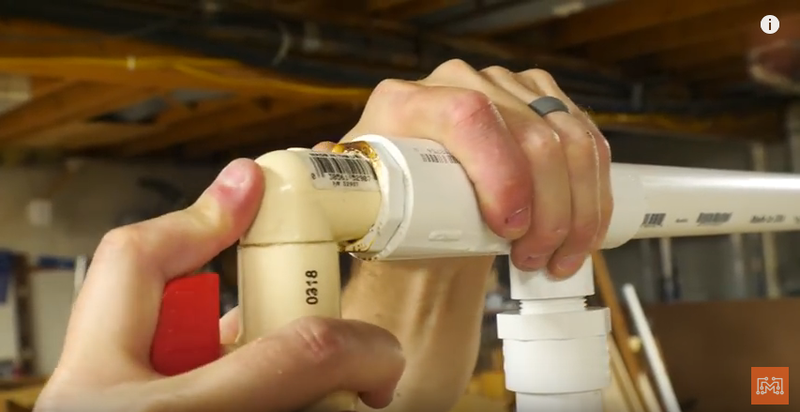 We started with the spray bar, a length of 1 1/2″ PVC capped at one end. This bar would be elevated off the ground by PVC braces that could snap in place. The other end was fitted with a reducer that would accept a 90 degree coupling and a valve. Straight down from there, a section of PVC would reach down to the ground and a female garden hose fitting would be press fit into the end. I drilled some holes in the spray bar so that water would hit many points along the slip n slide. Careful not to drill too many, I left some room to drill more accurate holes once it was placed over the plastic tarp. To add to the effectiveness of the slip n slide, I add a little clip-on hopper for some kid’s shampoo to drip from. 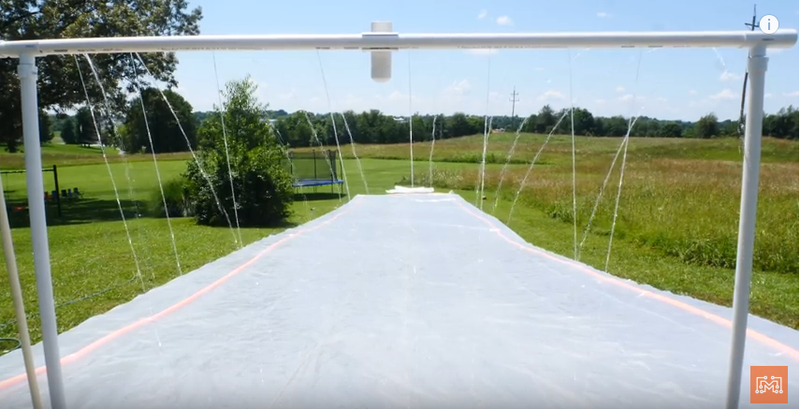 I attached the hopper to the middle of the spray bar so that over time, little drips of soap would fall on the slip n slide, mix with the sprayed water and help slippery-ize the whole thing. It worked great, and I had to refill it a few times throughout the day. Crank it Up and Get Sliding! 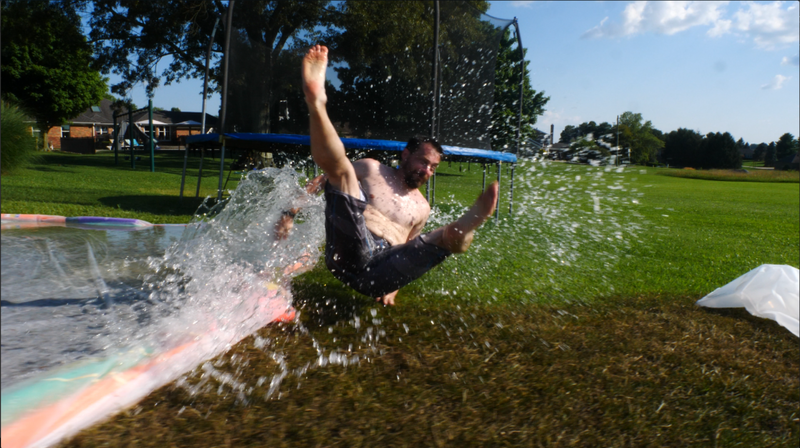 I was happily surprised at how effective this slip n slide was. All of the kids and adults had a blast! I bought some inflatable pool toys to use on the slip n slide, and they shot down the hill! The water followed the zig-saggy contour of the hill and added a new level of fun to a slip n slide. This project was easily made in an afternoon and the payoff was priceless. The whole event was so much fun and I now understand why Tony Rouleau has this party every year. This is absolutely the perfect addition to any backyard party and the kids were still slipping and sliding well into the evening while fireworks were bursting in air. 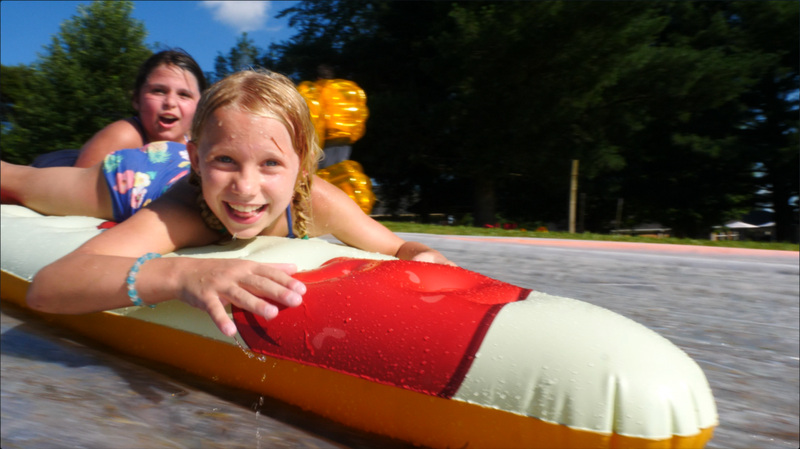 I hope you enjoyed this project and it inspires you to set a new family summertime tradition by making a huge slip n slide.